Born in Tehran, Ayat Najafi studied scenography in his hometown. 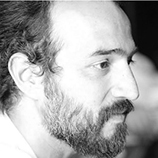 Since 2000, he has staged his directorial works to both Iranian and international audiences. In 2003 Ayat established the Arta Atelier, focusing on an interdisciplinary multimedia approach to theater as well as experimental short and documentary film. He is also a cultural-scientific alumnus of the University of Konstanz. “Lady Tehran,” which Ayat wrote and directed premiered in June 2009 in Berlin. In 2011 he followed with “Rasht-City of Women,” also performed in Berlin. Ayat’s first feature documentary “Football Under Cover”, co-directed by David Assmann, premiered at the Berlin International Film Festival 2008, winning the Teddy Award for best documentary and the Prix Europa Iris for best multicultural television programme of 2009. Ayat has also been on several high-profile festival juries. He has written extensively for publications on art and culture. Now, as I walk in the streets of Lahore, I realize that I too am in a supermarket – producing and consuming Pakistan like the “Iran experts” do Iran. The lens of my camera is tinted with the preconceived notions I have packaged and brought to Pakistan. In fact, the supermarket goes both ways: Pakistanis, too, produce and consume me as a certain plastic image of Iran. Ironically, with Reza Kazim’s words of revolution still ringing in my ears, I am engaged in the free-market capitalism of clichés.